Okay guys, so here we are at week number two of perfecting your ball striking and turning you guys into a bunch of ball striking geniuses and I hope everybody had a fantastic week last week and got in their thousand reps and had some really good progress. And felt what it's like to strike the golf ball nice and solidly. Now this week what we're going to to is, it's still going to seem like we have our training wheels on, but all we're going add small piece of weight shift here. And we're gonna give you a little bit of a check point to look for with these next thousand reps. And then weeks three and four, we're gonna really start to push you. We're gonna really ramp your speed up and by the end of it you'll have your training wheels off and you'll be striking the golf ball really, really well. Game plan wise, again, it's going to be a thousand reps this week. But we're going to start out by adding a little bit of weight shift but I'm going to do it with a very narrow stance. So you're going to see me stand about six inches apart. And what my goal here is, is just to feel like I'm getting a little bit more pressure in my right side. So you can see my weight's way over here in my right leg. I'm going to swing my arms out to my 9 o'clock position here, you can go a little bit further if you need to. If you feel comfortable with it. Then what I'm going to do, is rather than pulling my arms down, is I'm just going to shift all my weight back over to my lead side. So you can see now I'm just a little bit out past neutral joint alignment and that's just because my golf stance width is narrow at this point. So again, I'm going to shift over to my right, then I'm going to shift my weight to my left. So now what you can notice is, is that the weight shift, if I'm standing over here on my right side and then I shift my weight, you can see that that's moving my arms. That's helping you create momentum to this. So a lot of people want to get up to their right side and they want to pull their arms down and that's the exact opposite way of how we want to do things. We want to allow the body to pull the arms into the hitting area and allow you to release it with more speed. So again, we're going to start out slow, shift to the right, shift left, let the club release. Make sure you feel like your wrist and your forearms are really relaxed. You shouldn't have your feet coming up off the ground. So my goal today is that I'm going to get 200 reps of that in. Then what I'm going to do for my next 200 reps tomorrow, is I'm slowing going to start to widen my stance. So I'm going to go from about six inches to about ten inches. Okay, so now my goal at this point is to make sure when I shift over my right side, is that my right leg is going to go into neutral joint alignment here. Okay? So, shift, swing out to nine, shift, and now you're going to see that my left leg is in neutral. So I'm going to shift back into left and my forearms and writs rotate very relaxed. Then after I get 200 reps of that, I'm going to widen back up here almost to where I'm in my proper stance width here, about two inches outside of neutral joint alignment. And I'm going to spend the remaining part of my reps. So the next three days are going to be done at normal stance width. So I'm going to make a small shift over to the right, just about a one inch shift here. So you can see I haven't got my right knee all the way in neutral. Just a small shift. Out to nine. Big shift left, so now my left leg is in neutral. And then we're going to let it release. Now, a very, very important check point for this week is to not allow your right heel to come up off the ground. If your right heel comes up off the ground, you do 100 push-ups to alleviate this. We do not want this right heel to come up off the ground. That's what can cause the body to rotate. That's what can help bring your hips forward. So when you make your reps, small shift right, big shift left, release, right heel needs to stay down on the ground. And as another check point for you, when you get out here to the release point, I want both arms really relaxed. Both forearms should feel like they're really relaxed, almost touching each other and the toe of the club should be up to the sky or just slightly left. So start slow this week. We're just going to start out with our feet close together. We're going to feel our weight start to shift. We're going to see how the weight starts to move the arms. Starts to create some momentum for you. Then you're going to go to a little bit wider, little bit wider, until you're in full stance width. And then you're going to see that you can start to hit it a little more crisp and a little bit further than you did last week. Just by adding a little bit of weight shift. We're not changing anything else. We're not adding a ton of rotation to the body. We're not adding a ton of width. If you feel like you can make the arms go back a little bit further, so be it. Just make sure you're watching your impact positions. Make sure you're still getting that crisp contact. And we'll check in with you guys next week. So get out there. Get to work. Good luck. We'll see you guys next week when we start to really ramp this speed up. Let's make it a great day. 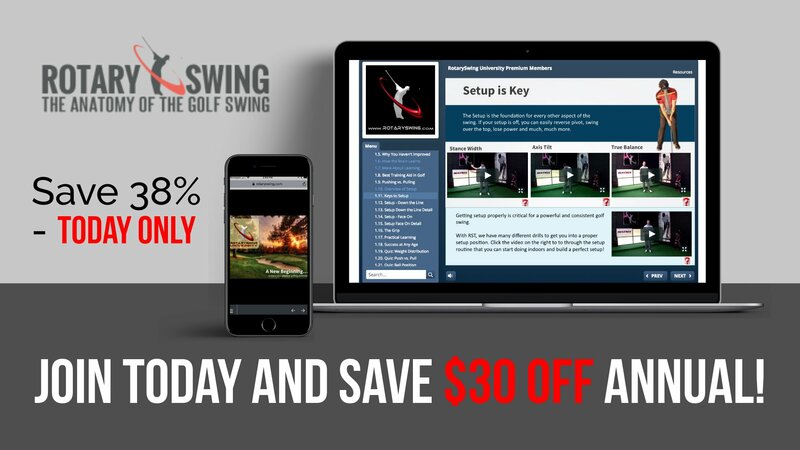 Get Your Free Membership to Finish Watching "Perfect your golf impact - 2 of 4" Right Now!